The latest module for Venger’s Crimson Dragon Slayer rules-lite old-school RPG clocks in at 19 pages, 1 page front cover, 1 page Kort’thalis glyph, ½ page editorial, leaving us with 16 ½ pages of content, so let’s take a look! So, the adventure begins with the PCs seeking shelter – whether from a meteor shower or something else; thankfully, there is a conveniently-located half-buried hunk of metal there. What could go wrong? Ahem, well, a lot. This being an adventure-review, the following contains SPOILERS. Potential players should jump ahead to the conclusion. All righty, only referees around? Great! It is no surprise that the PCs will find the hunk of metal occupied – within, Dr. Ebzub is performing an experiment of utmost importance – the planar and dimensional traveler is calibrating a portal and PC interference may have pretty fatal and unpleasant consequences. The random table provided does allow for devastating explosions or stranger things yet, including the skipping of the whole module, requiring some referee mojo to get back on track. If the portal is opened, hwoever, the important mission of the doctor may well bring the PCs to V’dreen, where the thin air can provide some hindrance, depending on the luck of the PC – a d4-roll determines whether and how the PC is affected, ranging from continuous, asthmatic gasping for air to not being affected at all. Weird: RAW, being winded imposes disadvantage on physical activities until you rest, whereas not being able to properly breathe only requires a rest, sans the rules-relevant repercussions. Pretty sure that’s an oversight. V’dreen has been abandoned by the gods and thus, a table of 12 strange susurrations carried by the wind can be found; the biggest city of the world, laarzdyn, come with 30 sample professions, which include the makers of invisible nets and being a colorist of artificial fish. Beyond these, we have a random encounter table that lets us randomly generate genetic experiments gone horribly wrong – determine base shape with a d10, type (including T-rex and bunny rabbit) with a d12 and weird feature with a d8 – the latter includes, obviously, tentacles, mutations or being vampiric. It should be noted that you still have to determine the basic stats and rules-wise, there are no default repercussions – “tremendous bite”, for example, is reliant on referee judgment to determine what it does. There are also 6 sample stranded NPCs to encounter, which range from stranded dark elves to Miskatonic researchers, pirates, a lecherous old captain and Ro-Dan, the raging mutoid. These write-ups are creative, fun and cool – but once again, fluff only – you’ll need to provide/improvise stats yourself. There are three factions here: Beyond the aforementioned Maura’kai, there are the Klyngon star elves and the B’xeeru, sentient clouds of semi-corporeal flesh; The Mauru’kai worship the Beast of V’dreen, a tentacle, tiger-striped arachnosaur that breathes paralytic gas. And yes, we get both artworks and stats for this horrid monstrosity. Hint: That’s one of the instances where PCs should GTFO…and it usually can be found at the base of the mystical steps that may lead from this place. The star elves hate and loathe the stairway and the beast, but are also afraid of the latter; finally, the b’xeeru despise the mauru’kai and want to keep the star elves away from the stair. Among the wonders of V’dreen are strange thinsg – the mauru’kai, for example, worship and fear the Faceless Demon, sealed and out of phase in his ancient temple…who, surprisingly, just wants to PCs to ascend the staircase and press a purple button, fixing the world. (Obviously, this is a ploy – but he’s willing to give the PCs an extremely potent, intelligent tri-bladed sword. The first creature killed with it will determine the strength of the demon as he manifests, so unsurprisingly, it wants the PCs to try to kill the legendary beast of V’dreen with it… There also is a garden containing three marble statues, which represent immortals lying in wait – defacing them can yield dire consequences, but oddly, not stats are provided – sure, they are immortal, but no information on attacks and tricks they have? There also is a massive one-eyed monolith, the nexus of worship for the fading world, where a d%-table and some guiding questions allow you to determine on the fly magic item-effects. That is, you interpret e.g. entries like “Spheres of Yog-Soggoth.” And yes, considering the beast’s stats, you better come up with some potent tricks for your PCs here. There also would be the slaver warlord Seejo Tulon, who provides the option to save some damsels in distress – neither is chain of hopelessness, nor his fear-inducing gauntlet have precise mechanical effects. Finally, there would be a way to escape, beyond ascending the stairs – a temporally disjointed wizard who may or may not have been eaten by a crudzu, a strange plant monster, does have a strange device and with it, they potentially may return…if the referee so desires, that is. If the PCs make it past the dread beast, they’ll find room 23, where they can witness the gods of V’dreen Dave, Jim, Phil, Ginny, Tom and Aleister thinking about the fate the of the world – and, in a funny jab at the horrid endings of Deus Ex 3 and similar games, 3 buttons that decide the fate of V’dreen- annihilation, integration into the purple islands or restoration. Editing and formatting are very good, though the rules-language is often a bit less precise and prone to requiring interpretation than what I personally prefer. Layout adheres to a red-veined, two-column full-color standard and the pdf sports a second, more printer-friendly version. Kudos! The artworks are original pieces in b/w and absolutely amazing. The pdf comes with extensive, nested bookmarks. Personally, I was disappointed to get no cool map of V’dreen – to me, it very much feels like a free-form hexploration and the lack of a map makes it all feel a bit opaque. Venger As’Nas Satanis’ Stairway of V’dreen feels very much like a fever-dream to me; I mean this as both a compliment and a criticism. On the one hand, we have a daunting, creative vision that is a pleasure to behold. The world feels primordial, strange and creative, and the graph-paper/fading world angle is amazing. This deserves heartfelt praise for its glorious ideas; none of the encounters/set-pieces featured herein are bland. That being said, at the same time, when rated as a commercial adventure, it feels a bit disjointed and sketch-like: Neither the star-elves, nor the b’xeeru are mentioned or explained in any depth beyond the brief, fluffy introductions. No stats or the like; they feel like afterthoughts to the mauru’kai. While we learn of the strange town of Laarzdyn, we do not learn what its populace is – mauru’kai? Star elves? B’xeeru? A blend? Something else? I can accept Venger’s philosophy of requiring referee interpretation in his system; Crimson Dragon Slayer is rules-lite enough that this doesn’t necessarily break the game. But at the same time, here, there is a lot left to referee. The genetic experiments, the marble demons, the regular inhabitants…all require statting by the referee. Getting any sense of the place and its geography, in lack of a map, requires some serious close reading by the referee as well. Sure, I do get the idea here – make everything blurry, haze-like, allow the referee to move at his/her own pace. My contention is, however, that both the way in which stats and rules-text are missing in some instances and the lack of a map (even a point-crawl-y one would have worked!) conspire to generate a haze; the module, ultimately, becomes harder to use than it should be. The lack of a synopsis also adds to this, making a piece of inspired writing harder on the referee to run that it should be. The beast of V’dreen is amazing and the primary obstacle of the module, with its ridiculous amounts of hit points. The PCs can even get a McGuffin blade to slay it. But what if they want to lead the star elves into an attack on it? Well, you’d need to improvise stats for them. The magic items the PCs will very much need to have a chance against the beast, require some serious, spontaneous Referee-mojo. Chances are, you don’t have a preconceived idea of what the eye of K’tulu does, after all. It is in these instances where I really wished the pdf would be more precise, would provide more guidance, a bit more structure. Combined with the lack of a map, we get an impression of a hazy fever-dream – a brilliant, far-out and creative environment and great set-pieces. But from a structural point of view, the module also, alas, sports the imprecise and slightly confusing nature of that dream. This is really hard for me. As a private person, I absolutely loved this adventure. I adore its creativity. The beast is glorious and so are all the components of V’dreen – the setting and ideas are fresh and fun. As a reviewer, however, I also have to take into account the structural weaknesses that haunt the module and its at times annoying opacity. I have tried in my review to reduce this as much as possible, but in the pdf, we jump from the mauru’kai ambush to notes on their camp to the factions to the edge of the world, to Seejo Tulan…you get the idea. The structure of the presentation, as much as its minor oversights, constitutes a major drawback, particularly for less experienced referees – it is, in lack of a unifying backdrop and courtesy of its inspired weirdness, more opaque and hazy than Venger’s Revelry in Torth. If you’re a veteran with great improvisational skills, then get this! This is an inspired little sandbox! However, if you want something to take up and play, if you have a hard time dealing with sandboxy environments, then this will challenge you more than most comparable modules, courtesy of a lack of summary or detailed presentation of its components. Personally, I had a blast with this – while I was annoyed by the amount of work I had to do to fill in the blanks, more so than even in many large-scale hexcrawls, the imaginative vision of this module remained strong enough for me to make it worthwhile. 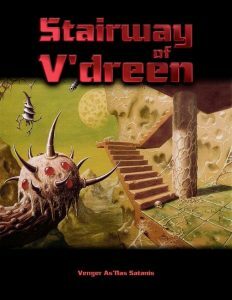 I can see this fail horribly, though – novices or referees accustomed to more hand-holding when running a module should probably think twice before embarking on the journey to V’dreen. Ultimately, my final verdict will hence clock in at 4 stars. It is also available as part of the second Trinity of Awesome+1 print compilation here! I agree with you – this adventure is more bare bones than usual (even for me). Some of it was part of the “fading dream” aesthetic that you mentioned, some of it was trying to finish 3 scenarios in a single time frame. Haste got the better of me, yet I still think there’s plenty of awesomeness to go around. Aye, I agree – I loved the creativity of V’dreen and I enjoyed the dream-like aesthetic – I did like it in Torth, after all…but at one point while running it, I realized that it became a bit too hazy for the highest ratings. A general overview map or something like that may have helped…or, well, more details. I do understand the circumstances, though! After giving it some more thought, I think a “Return to V’dreen” might be a good idea. Then, the realm would be restored (or showcasing V’dreen in its prime) with even more weirdness going on.